The cost of the 2011 cutbacks in federal spending will fall most directly on consumers and retirees by scaling back Social Security, Medicare, Medicaid and social spending programs. The population also will suffer indirectly, by lower federal revenue sharing with U.S. states and cities. The following chart from the National Income and Product Accounts (NIPA, Table 3.3) shows how federal financial aid has helped cities shift the tax burden off real estate, although the main shift has been off property taxes onto income – and onto consumption (sales) taxes. 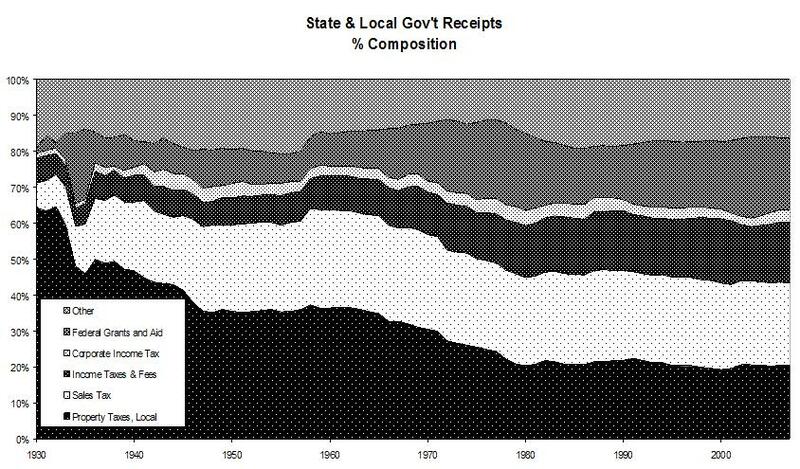 State and local revenue, 1930-2007. Untaxing real estate has served mortgage bankers by freeing more rental income (the land’s site value) to be paid as interest. Property taxes have not absorbed anywhere near the rise in debt-leveraged housing and commercial prices. However, this has not lowered the cost of housing for most people. New buyers must pay a price that capitalizes the property’s rental value. Less and less of this payment has taken the form of local property taxes. More and more has been paid to mortgage lenders as interest. So cutting property taxes has simply left more revenue to be capitalized into higher debt-financed prices. While homeowners saw their carrying charges rise, they nonetheless felt more affluent as real estate prices rose – inflated on easier and easier credit terms. Prices rose faster than mortgage debt as long as (1) interest rates were declining; (2) loan maturities were stretched out (ultimately reaching the point of zero amortization rather than the old-fashioned 30-year self-amortizing mortgages); (3) down payments were shrinking toward zero (rather than requiring 20 percent equity as used to be the case) and indeed as “liars’ loans” led prices to be bid up recklessly; and finally (4) cities refrained from raising property taxes as fast as market prices were rising. This left more revenue to be capitalized into higher prices, providing capital gains that home owners were encouraged to treat like “money in the bank” – by taking out home equity loans. This rising mortgage debt was increasingly important in enabling people to maintain their living standards, especially as they had to pay more for housing. So what appeared to be affluence and rising net worth from the value of one’s home on the asset side of the balance sheet found its counterpart in debt on the liabilities side. From the local fiscal vantage point, these debt-leveraged price gains represented uncollected user fees for the site value provided by public infrastructure and rising prosperity. The bankers ended up with the rising flow of rental value, not the cities. This obliged tax collectors to look to other sources of revenue. So homeowners paid out what they seemed to be saving in modest property taxes in the form of rising sales taxes and income taxes. Now that federal aid is falling – along with revenue from sales and income taxes – local budgets are falling into deficit. But for many cities and states, their constitutions and regulations prevent them from running deficits. So they face a number of hard choices. It is hard to raise property taxes back toward earlier rates, because the rental income already has been pledged to the mortgage bankers. To tax heavily indebted property would lead to more foreclosures and abandonment. And the Obama Administration’s hope that banks somehow will use the Federal Reserve’s tsunami of cheap (0.25%) reserves and credit to re-inflate a new real estate bubble is in vain, because bankers have little interest in lending to property that is still sinking in market price. It is easier to speculate on interest-rate arbitrage with the BRICS and get a foreign-exchange premium as well, or simply to play the market. Banks report winnings in the derivatives trade day after day, with nary a loss – an indication of how poorly their hapless customers and other outsiders must be doing! So the path of least resistance for most cities and states is to cut back spending on public services, and above all on pension plan contributions. The ultimate sacrifice (and the aim of financial predators) is to sell off public land and buildings, roads and other transportation services, sewer systems and other basic infrastructure. In this aim, the investment bankers are being aided and abetted by the credit ratings industry, threatening to downgrade cities that do not sell off their public domain. In this respect the financial end-game of privatization is similar in the United States to pressures by the European Central Bank to force the indebted PIIGS economies to engage in privatization sell-offs, Third World and post-Soviet style. Just as in Europe, when revenues are squeezed and something must give – either debt service, payment to pensioners or current payments to labor – the financial sector is seeking to take all the available surplus for itself. This puts creditors in the forefront of today’s class war against labor. On the eve of the September 2008 financial crash, cities such as Birmingham, Alabama and Chicago already were looking for ways to cope with the fiscal squeeze imposed by political pressures from the major local campaign contributors – the real estate and banking sectors – to cut property taxes. One seeming path of little resistance was to gamble in the Wall Street financial casino, hoping to make easy gains rather than making landlords, wage earners or consumers pay higher taxes. Landlords and bankers encouraged this speculation as an alternative to taxing property. Landlords wanted to pay less in property taxes, and banks knew that whatever rental value buyers could save in the form of lower taxes would end up being used to bid up prices to capitalize into debt service for mortgages to buy properties up for sale. Here is the dilemma that states and cities now face: So much urban property is sinking into negative equity territory that a rise in property taxes will lead to even more foreclosures and abandonments, and hence even lower fiscal returns. To avoid this, cities are seeing Chapter 9 bankruptcy as the main route to free themselves, especially from problems that stem from an unwarranted trust in bankers to help them out of the earlier fiscal squeeze by putting them into losing financial gambles. Orange County in California successfully sued Merrill Lynch to recover damages, and Birmingham also was awarded recovery payments from JP Morgan Chase. Now that financial fraud has been decriminalized for all practical purposes, most financial victims are obliged to sue for reimbursement in civil court without much help from prosecutors. Alabama’s state capital Birmingham is a case in point. After a predatory financing arrangement to upgrade its sewers in 2008 forced its Jefferson County into bankruptcy, the Securities and Exchange Commission (S.E.C.) negotiated $75 million in fines and reimbursement of fees to be paid by JP Morgan Chase as lead lender and negotiator for the complex interest-rate swaps they had advised the country to take, ostensibly to protect its economic interest. The banks also forfeited nearly ten times this sum ($647 million) in termination fees. But the court-appointed receiver grabbed the $75 million settlement for payment on the debts the country still owed. As usual, the banks had paid the fine and made reimbursement without admitting any wrongdoing. To the financial sector, deception and fraud is part of the game, after all, not a tactic that can be prosecuted as criminal. They paid their fines without admitting any wrongdoing, and without even admitting the S.E.C. charges. They merely paid up and kept silent – while the Justice Department and Internal Revenue Service were still in the time-taking process of ruling on legal claims brought by Jefferson County. The case prompted bankers and bondholders to bring pressure on the state of Alabama to take responsibility (that is, take on the debt liability) all on behalf of statewide taxpayers, and to demand that all lawsuits brought for financial fraud to be dropped. “Responsibility” is supposed to be only for debtors, not for the financial sector itself. This is how the banks have managed to rewrite the laws, after all. Jefferson County is now debating whether to declare Chapter 9 bankruptcy to free itself from debts that can be paid only at the cost of disrupting economic continuity and living standards. The city’s debt quandary is a microcosm for the U.S. economy as a whole. Its lowest-income residents are burdened with financialized charges for sewer-system debt payments so far beyond their ability to pay that they face the same fate as Latvians, Irish and Greeks: As the local economy shrinks, they must move in order to find jobs – in places less debt-burdened and hence lower-cost. The “free market” choice is to emigrate to flee the debts imposed on their economies and on themselves personally. But the government usually provides relief only for creditors – above all, relief from criminal prosecution for their business plan that involved making loans beyond the debtors’ ability to pay. Some states have fraudulent conveyance laws to prevent this, as well as to prevent banks from misrepresenting the quality of their loans to outside investors. There are laws to punish appraisers who give false appraisals, and mortgage brokers who fill in false income reports to qualify for loans. But the S.E.C. has seen its staff and budget slashed and deregulators appointed to oversee its affairs. It has no authority to prosecute, only to make recommendations to the Justice Department, where Attorney General Eric Holder has followed the Obama Administration’s support of Wall Street, feeling no obligation to live up to the promises to make that a change from the Bush Administration’s similar lax behavior. The financial sector recognizes a dimension of economic behavior that textbooks politely refrain from citing: the ability to capture regulatory agencies, gain control of the courts and buy control of politics. The Supreme Court has ruled that corporations have the same rights as individuals to contribute to campaigns, a euphemism for buying the loyalty of politicians and judges, and obtaining veto power over regulatory appointees. Corporations pay lower income-tax rates and are free of value-added and excise or other sales taxes paid by consumers. Unlike real people, corporations cannot be sent to jail. Corporate shells shield owners and managers from criminal prosecution for the wholesale frauds that have left Countrywide Financial, Bank of America, Citibank, JP Morgan Chase and other pillars of the banking community free to make civil settlements for deceptive policies without admitting wrongdoing. And whereas individual crooks need to pay their own lawyers, corporations pick up the tab for their managers, while contributing generously to politicians who rewrite the laws to decriminalize fraud and deceptive business dealing. The corporate-backed media applaud politicians who insist that families “take responsibility” for their unemployment risk, debts and health care – while bailouts free the wealthy from having to suffer losses on bad loans. Rhode Island recently rewrote its laws to place bondholders ahead of other creditors, including pension recipients. Under the new law, “city officials who intentionally fail to pay bondholders can be removed from office or held personally liable for the payments.” In contrast to the pro-debtor trend of legislation since the 13th century, wealth at the top of the pyramid takes precedence over retired schoolteachers and other public employees. The effect has been for the city of Central Falls, Rhode Island, to seek Chapter 9 bankruptcy protection to avert a 34 percent cut in pensions to its retirees in order to pay bondholders. Chicago has balanced its budget not by taxing finance and real estate gains, but by selling off its roads and other basic infrastructure. Much as in feudal Europe, the leverage is financial. Privatizers are charging tolls and even installing parking meters on the city’s sidewalks to charge cars for parking by the minute. New York City has slashed is public subway and bus service, extending commuting times and making life harder. It has privatized its television and radio, replacing public airtime with commercial advertising. The ending of federal revenue sharing will exacerbate local budget constraints. The fact that many cities and states have constitutional requirements of balanced budgets – just as Republicans advocated for the federal government in the 2011 debt-ceiling agreement – requires that taxes be raised, public services cut, or assets sold off. California’s Proposition 13 prevents the state from raising property taxes in keeping with market prices, tying its hands fiscally and obliging it to commercialize its once-great university system. Students must now take on enormous education debt for what formerly was free or subsidized. New York City’s real estate tax likewise favors large investors and wealthy homeowners, at the expense of co-ops and condominium owners in apartment buildings. The rising rental value that local tax collectors relinquish does not lower housing costs; it merely enables the land’s site value to be paid to bankers. Rising debt-inflated housing prices have priced the city out of the market as the manufacturing center it formerly was. Its textile buildings and other industrial properties have been gentrified, leaving it a one-industry (finance) town focused on Wall Street. At the international level, Irish voters confirmed the policy of taking bad European Central Bank advice to put the interest of bondholders first by taking bad bank loans onto the government’s balance sheet and taxing the population to make up the losses, even at the cost of imposing a generation of debt-strapped depression on their economy. This is the self-destructive road to debt peonage that the IMF and World Bank forced Third World countries to follow for many decades. The fact that this ethic reverses centuries-long social values promises to make the great debate of the 21st century over the issue of which debts are paid and which will not be – and how much debts should be written down. Mary Williams Walsh, “A County in Alabama Puts Off Bankruptcy,” The New York Times, August 13, 2011. Michael Corkery and Kelly Nolan, “Alabama Bankruptcy Fight Hinges on Sewer-Rate Increase; Impact on Poor Bedevils Deal,” Wall Street Journal, August 11, 2011. Michael Corkery and Michael Aneiro, “Alabama County Rejects Creditor Plan but Delays Bankruptcy Decision,” Wall Street Journal, August 13, 2011. Michael Corkery, “Bondholders Win in Rhode Island,” Wall Street Journal, August 4, 2011.